The black fist Afro comb is an evocative symbol of the second half of the twentieth century. Coming into production at some point in the 1970s, the comb’s marriage of object and iconography was a perfect one. With its reference to the Black Power movement, and its historical links to the re-emergence of the popularity of the wider-toothed hair pick in the USA to serve the Afro hairstyle, , the comb has become more than simply representative of an era and a political affiliation. It also symbolises Black pride and identity. During this period many African Americans sought to reaffirm their cultural identity by not straightening their hair to follow mainstream European fashions. The traditional ‘Afro’, which first emerged in the 1950s, is a style not a natural phenomenon: the hair needs to be cut in a certain way and maintained with a pik or comb. Because many types of African hair are tightly curled or coiled, a wider- toothed comb is a healthier way of grooming combing through the hair. For those who chose to grow their hair in an unprocessed state, the longer teeth of the pik were perfect for maintaining an Afro hairstyle. 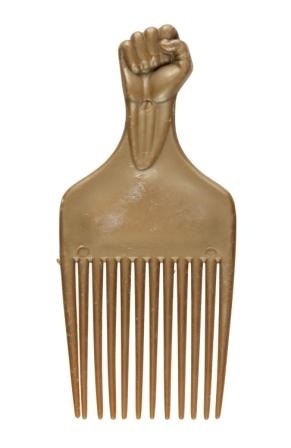 The earliest comb of this form to emerge was patented in 1969 by two African Americans, Samuel H. Bundles Jr., and Henry M. Childrey (Tulloch). It was not long before variations of this useful new tool began to emerge and be patented. 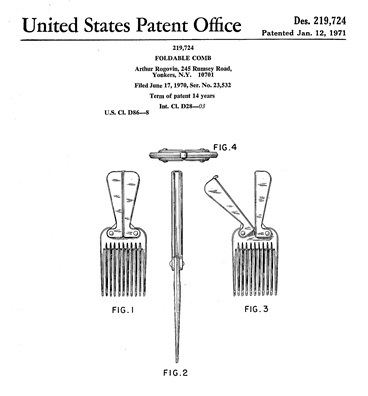 This included the folding comb, the patent for which was filed in 1970 and granted in 1971 (fig. 1). This particular design was demonised by some sectors of British society in the late 1970s and early 1980s. Participants in the Origins of the Afro Comb project recall being stopped and searched by the police and having their combs confiscated because they were viewed as potential weapons. Tracking down the original fist comb proved to be difficult. It was only days before the exhibition’s opening in July 2013 that I received a comb from the original manufacturers and was then able to track down the patent at the United States Patent Office. 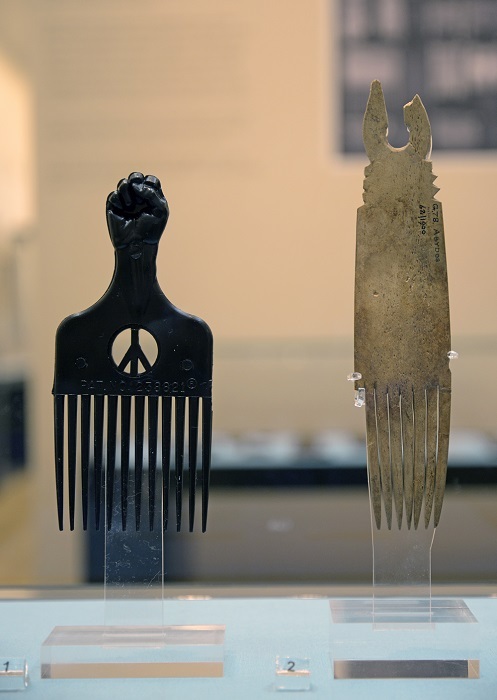 The original black fist comb, shown above next to a 5,500- year- old comb from Egypt, (fig. 2), was designed by Anthony R. Romani in 1972; this much I had established by speaking to Mrs Romani, who still works at the company in Pennsylvania. 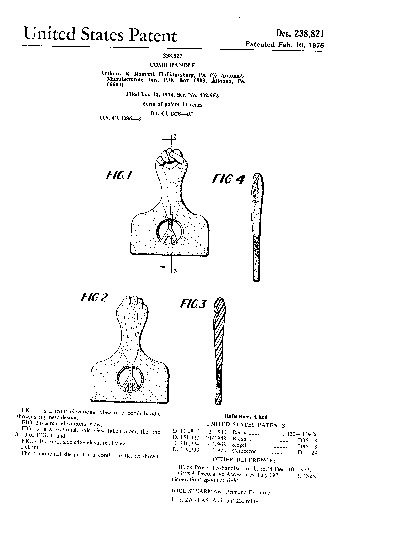 The comb, known as a ‘styling pik’ was submitted to the US Patent Office in 1974 and the patent was granted in 1976 (fig. 3 below). 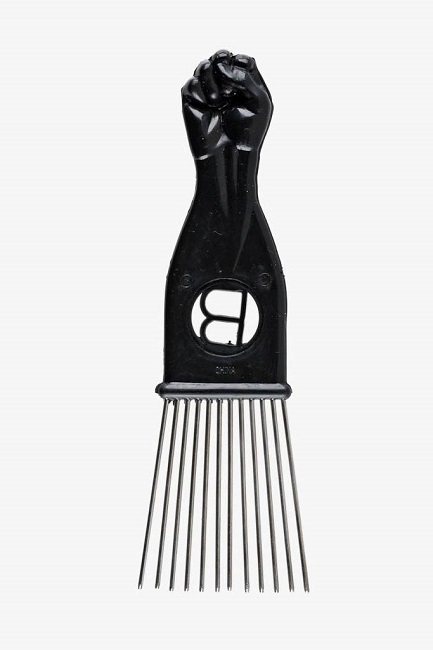 This iconic comb represents the ethos of the civil rights movement, with the power of the clenched fist and the peace sign in the centre. For subsequent generations the comb has a range of meanings. In preparation for the 2013 exhibition ‘Origins of the Afro Comb’ at the Fitzwilliam Museum, Cambridge, whenever I met someone who had a black fist comb I asked what it meant to him or her. Answers have ranged from: ‘Black Power’; ‘Black pride’; ‘Nelson Mandela’s release’;‘ it’s just a nice shape’; and ‘unity’. For younger generations the combs also seem to take on a sense of the retro or ‘old skool’. It is perhaps the comb’s multiple associations that have ensured its success across generational divides and time. Whereas some of the young people I spoke to were not aware of the details of the American Black Power movement, their own associations with the design were nonetheless linked to ‘Black’ culture and identity. The original combs are not readily available in the UK; most of the fist combs that are sold here are manufactured in China (fig. 4 above). A variety of different forms of picks and combs are also now available to serve different types of hair and hairstyles. These include a number of versions of the comb with metal teeth (fig. 5 below), which many people find preferable to the plastic ones, which are liable to bend, and their surfaces to become worn and damaged. Many of those interviewed said that the plastic combs they had used were not strong enough for their hair; there is a notable difference in rigidity between the original combs and those manufactured outside of the USA. A version of the clenched- fist comb was also manufactured in Nigeria, at least from the early 1980s (fig. 6 below). This provides a good example of unity and cultural exchange between people of African descent in North America and in Africa. The comb illustrated here belonged to the artist Grace Salome Kwami, who purchased the comb when visiting her sons who were working in the Cross River State, Nigeria, in 1982 or 1983. They are still made in Nigeria today in a variety of colours and are readily available in shops and markets, having replaced the rich variety of traditionally carved combs that once existed (fig. 7). 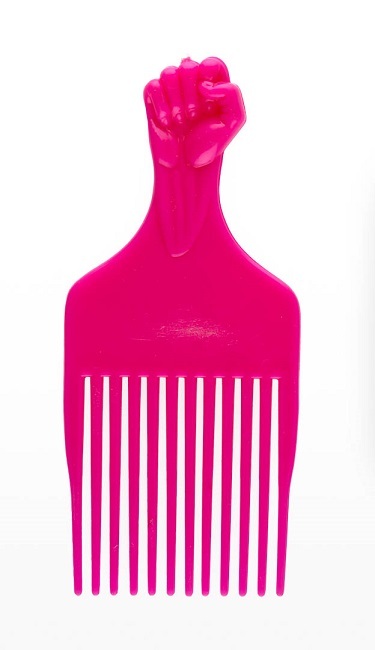 Many people who are not of African descent use an Afro-style haircomb. Some were introduced to the combs in the 1980s, when the ‘perm’ was a popular hairstyle. For others this design works better for combing wavy, longer or wet hair. However there is something about the ‘fist’ Afro combs that would make their use by someone of non-African descent uncomfortable. Thanks to friends and my own passion for this particular design of comb, I have over 30 versions of the fist comb, but as a white person I would feel uncomfortable using one of them on my hair. Why? 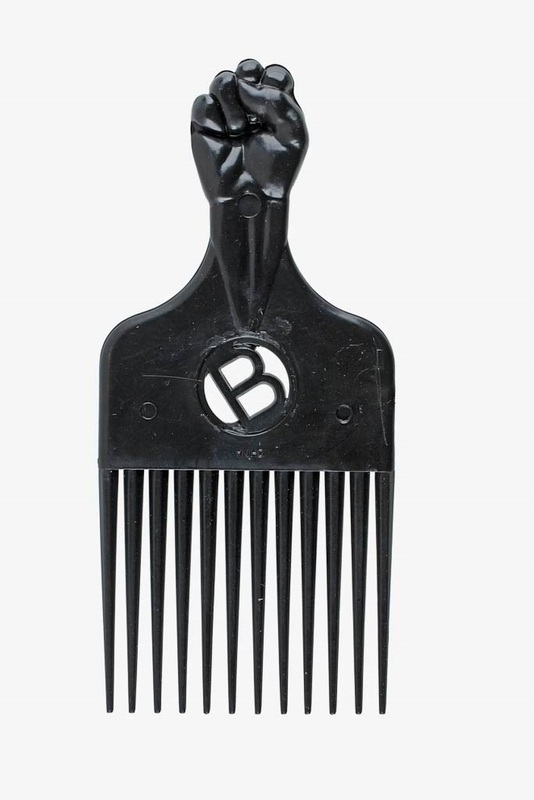 Because these combs are more than simply an attractive tool for combing hair, they are embedded in Black history, culture and identity and are more than simply just another comb. Sally-Ann Ashton is Senior Assistant Keeper in the Department of Antiquities at the Fitzwilliam Museum, Cambridge. She was curator of the special exhibition Origins of the Afro Comb (July-November 2013). She and runs a project teaching Black history in English prisons. S-A. Ashton, Origins of the Afro Comb: 6,000 Years of Culture, Politics and Identity. Cambridge: The Fitzwilliam Museum, 2013. S-A. Ashton, (ed.) Origins of the Afro Comb, pp.20-23. A. Kwami, ‘Drawing a comb’ in S-A. Ashton, (ed. ), Origins of the Afro Comb, pp.30-33. M. McMillan, ‘Good hair/bad hair: Black styling, culture and politics in the African Diaspora’ in S-A. Ashton, (ed), Origins of the Afro Comb, pp.48-59. C. Tulloch, ‘The resounding power of the Afro comb’ in G. Biddle-Perry and S. Cheang, (eds. ), Hair: Styling Culture and Fashion. New York and Oxford: Berg, 2008, pp.124-38. This was an important exhibition which inspired me to visit the exhibition twice and write 2 blog posts on the exhibition in the Fiztwilliam Museum Cambridge and Bruce Castle Musuem, Tottenham London. I didn’t know that the black fist meant something my friend told me me it symbolises black power but I didn’t believe him but then I got thinking and the I found this page which actually tought me something and im glad I did because now I know and I just noticed there are no white ones … … … … … … … .. .
hair pick. noun. A flat square-shaped comb with a handle and long teeth, used to style hair. I’m interested in knowing is it proper edicate to walk around in public with a Afro Pik in your hair? My 34 yr old Nephew is trying to convince me that it is stylish but I heartedly disagree. It was part of the REVOLUTION to wear our hair in it’s NATURAL STATE in 1969. Thanks to James Brown’s song “Say it loud, I’m black and I’m proud”. To have the afro combs and the picks to groom our hair was new to us also. To wear the FIST DECORATED PICK was a statement and needed to be worn in conjunction with the Natural (Afro). I was like wearing any hair ornament.// My first instinct was as yours. I thought it was uncouth to wear until thought to myself (why/) Then i realized that we are culturally conditioned to believe what ever white society believes is right, is right for us also. So right-on to our Do Rags, Skull Caps, Stocking Caps, Picks, Afro Combs ETC…we should wear them as we think is pleasing to us!! !